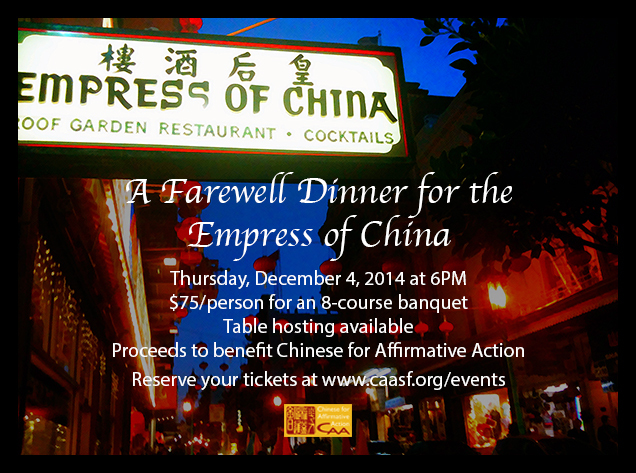 After hosting generations of wedding banquets, family reunions, and community events for organizations like Chinese for Affirmative Action, the beloved Empress of China restaurant in San Francisco will be closing its doors at the end of next month. Many of us have fond memories of the Empress of China. For CAA, it has been a place where our supporters have gathered to celebrate justice, reconnect with friends and allies, and enjoy a memorable plate of sticky rice stuffed chicken. To help us say goodbye and celebrate its 48 years, CAA invites you to join us for a farewell dinner on Thursday, December 4th at 6pm. We’re offering an eight-course menu at $75 per person with proceeds to benefit our civil rights and social justice advocacy. Please reserve your tickets online here. We do anticipate selling out, so purchase your tickets soon. You can also purchase a full table to host your friends and family. We are not taking walk-in guests the night of the event.